| Neil completes the double by passing both bike tests first time! Home > News > Neil completes the double by passing both bike tests first time! Another of our customers, Neil, has joined the not-so-exclusive “Double-First” club by passing both his module-1 and module-2 motorcycle tests at the first attempt. 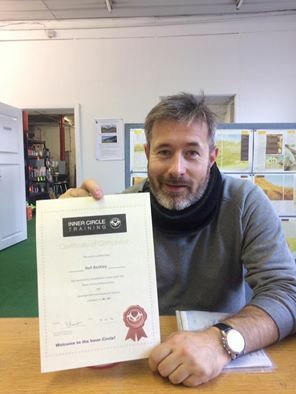 Neil came to us having completed his CBT with another local school, choosing to take our 2.5-day “Experienced Rider” course as he rides his Derby 125cc bike regularly, has a full car licence and was confident handling a larger bike having previously ridden one on private land. One of his main reasons for choosing us to help him get his full licence is our excellent record of first-time passes – and now he’s joined that group having passed both tests at the first attempt. On Monday he passed his module-1 test with a clean sheet (zero faults), demonstrating excellent machine control throughout. This morning he had to deal with drizzle and Stockport traffic but rode well enough to secure another first time pass and gain his full bike licence.